I read her a little something I had written up, and she asked me those questions. I had never thought about it, but she was right. That room was unique. I didn’t know anyone else who had a sewing room in their house. 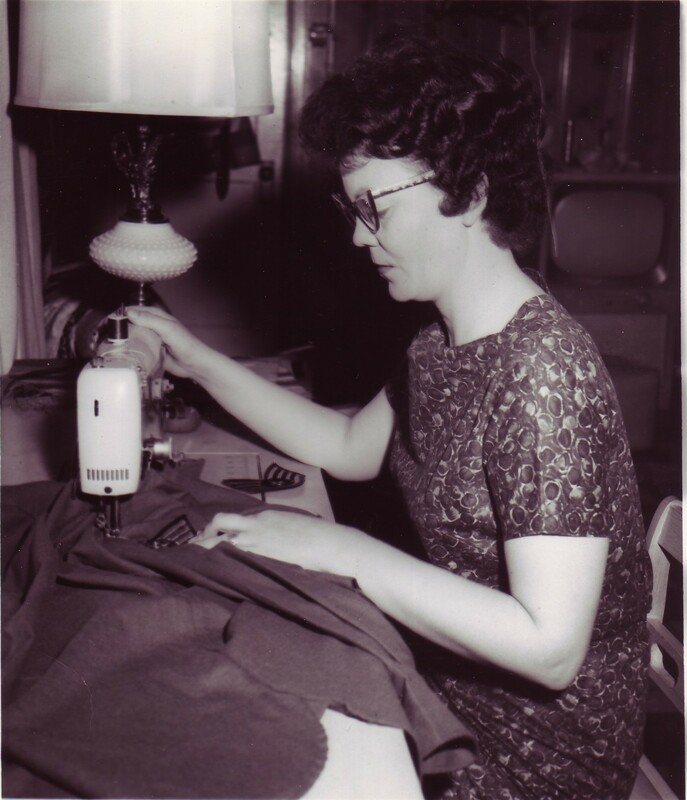 My grandmother was, as she always described herself, a seamstress. When I was a child, I used to go to her house every day after school until my mother’s workday ended. I usually sat at her coffee table and did my homework. All the time, the burr of her sewing machine could be heard in the background, and there was usually a visit from a customer or two. She did everything from alterations to wedding dresses. When I was at Kenyon last summer, we did a wonderful place exercise in which I wrote about that room, and ever since that writing activity, that room has been a deep well of inspiration for me. I wrote a zuihitsu poem about it, which I won’t share here because I would like to try to publish it—rules about prior publication are pretty strictly defined to include personal blogs. I have returned to that to room many times. I can see it so vividly. 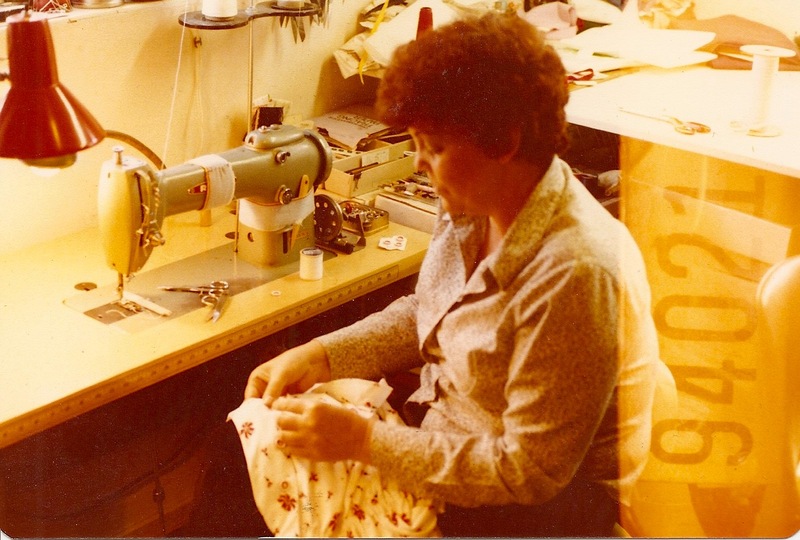 Granna had several sewing machines, but the ones I remember being set up when I was a child were a metallic green Rex, a newer Bernina, and a Juki serger. She also had a complicated-looking ironing apparatus. The iron was always hot and was attached to a large steam bottle that looked like an overlarge IV. She had a large table in the corner. It was covered with fabric. I don’t think I ever saw its surface. She had stacks and boxes of old patterns. Many of the patterns featured on the McCalls Pattern Behavior Tumblr wouldn’t have been out of place in her collection. There was an area to the right of her Rex, which was her main sewing machine at the time. A small table nestled between her sewing table and the large fabric-laden table against the wall; here Granna kept spools of thread and trays with bobbins, pins, needles, sewing machine feet, buttons, and every kind of sewing notion you can think of. In second grade, I had made her a memo board with woodgrain contact paper and my picture—grown out perm and overlarge permanent teeth coming in—framed in pieces of lace. It still hangs there, next to her machine. I could usually find stale pieces of Freedent gum on that table, too. The floor in that room was black tile, pitted with scars from the wheels on my grandmother’s chairs as she whipped around the room from machine to machine. It is probably the place I associate most with my grandmother because it was where she spent most of her time when I was a child. I used to go back and visit her in the room. Often she would be humming. When asked her what she was humming, she always said she didn’t know. She usually had two or three straight pins sticking out of her mouth for safekeeping. When I last visited my grandparents, I was able to interview my grandmother about her career and hobby as a seamstress. I hope you enjoy the digital story I made. Wow, did this bring back memories. I sewed my own dress for senior prom. What a wonderful slice of history as well as a slice of life. Thank you! My grandmother made my prom dress, too. Actually, also the dress I wore to the 8th grade dance as well. This is so special and moving. I love the interview format, the video is so memorable and lovely. It brought your Granna to life for the reader. I cannot believe how neat her sewing room was. Mine has never looked like that. 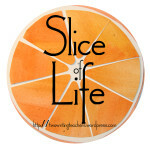 Your piece inspires me to write my own sewing story. As you Granna said, it can be everything, like writing is to some people. There is something about that kind of creation, the textures of the fabrics, and the fact that you can wear it in the end. The old Singer brought back memories, too. I learned on a machine just like that, and I have my grandmothers Singer with the foot pedal in my living room. Thanks for a very special piece. The poem I wrote was about our twin creative passions of sewing and writing. Thanks for the comment. I’m glad you enjoyed it. My baptismal gown to my wedding gown….my Grandma made them all! Thank you for this beautiful trip.down memory lane. Thank you! Grandmothers are special. I remember my mother having those pins in her mouth while she worked at her sewing machine. She only sewed for the family and the house – curtains, pillow cases, that sort of thing. We were always traveling so much that our visits were both rare and brief. All the more memorable, I suppose. Thanks for a great post and for sharing your grandmother with us! I was always worried she’d swallow one. What a beautiful piece. It made me think of my grandmother. She wouldn’t call herself a seamstress, but she did make a lot of my mom’s clothes when she was growing up. Then my mom made clothes for us–which are in most of my favorite pictures from the 60s. But the most precious part of your piece is the video! Wow! What a treasure you have there! Thanks! My students create digital stories each year, and I made some to use as models. Plus I was lucky in that my digital storytelling workshop was in Denver, and my grandparents live close. I was able to get a lot of interviewing done. I love your digital story. Your grandmother’s voice adds so much to it. My mother sewed on a Nechi, made clothing for 4 girls and lots of Barbie dolls. Granna made her share of Barbie clothes, too! Thanks for sharing this story, Dana. You describe it so vividly that it is clear how special this particular place was for you. It reminds me about going to my grandparents after school, every day from elementary school to high school, while my parents worked. I think I need to write that story! Lovely tribute, Dana. I’d seen the digital story about your grandfather but not this one about your grandmother. I’ve been thinking about some special times w/ my grandfather. It’s impressive that your grandma had such an amazing talent. I’ll never look at a John Denver shirt the same way again! I was so surprised to learn that! I can’t say that she made the one he’s wearing in the picture, but she did make shirts that looked like it.